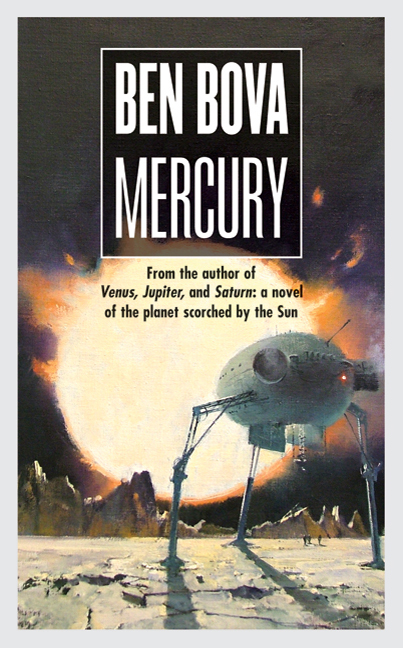 This is the second of Ben Bova’s ‘Grand Tour of the Solar System’ series that I’ve read. The other one was ‘Jupiter’ and I think this one is better. This is definitely a story about people. It is about how Saito Yamagata, business tycoon, achieves his dream even as he fails his life; about who Dante Alexios, engineer, is and why he sets out on a path of vengeance; about Victor Molina’s fall from a position of respect as a scientist. The mighty mostly fall on Earth, but find their true ends on Mercury. The planet is more than just a background. It’s natural features provide many of the various characters’ motives and explain how these people come together to move through their story. The writing is readable with good descriptions and explanations and the complex backstory is well handled. At the basis of the novel is a love story, coming from the story-past into the story-present and on into the future. Unfortunately this is the thing I found somewhat difficult. I know there are people whose desire to possess the love object takes strange and dangerous routes to the goal, but I didn’t think this was made totally convincing in this book. That there should be two people doing the strange and dangerous made it even harder to accept. I think one of the reasons for this is that the loved one did not have a strong enough role to make the excessive desire believable. I won’t say more about this as it would give too much away. On the whole this didn’t spoil the book for me – it’s introduced far enough along in the story for empathy with the characters to have developed anyway. The book is straight sci-fi – space opera even – no ‘steampunk’, ‘science fantasy’ or other sub-genre. Most science fiction fans will be familiar with Bova’s work. Any who aren’t and would like to make his acquaintance would do well to start here.